Hello, can you tell us something about yourself? - Hi. I would rather not say my name publicly. I have been a ultras almost 17 years now. I started in 1993/94. I am 32 years old. Can you start by telling us something about the history of your group? - The history of the group can be divided into 4 phases. The first phase was the time before the occurrence of organized groups back in the 70's, when all the club fans took buses or trucks to go and visit the places where their clubs played. At that time, the situation was the same both home and while visiting. 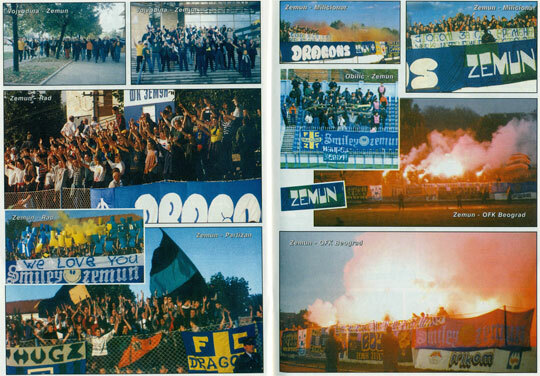 The second phase beginnings in mid-eighties, when for the first time you can see hints of using flags for cheering in stadiums, and the visits become more regular. The first teams in Zemun were Testas Caldas, Pajtosi and Godfathers, who then agree on the common name of Taurunum (1987). Taurunum is the Latin name for the town of Zemun. As time goes by the word Boys is added; but later on the Boys sub-group became the bearers of the grandstands, so today the full name is Taurunum Boys. As the war broke out in former Yugoslavia, the group begins facing a crisis, and the games become more sporadic, visits I mean. We were going to all of them, but the organization level was really low. Although I believe it was not the case just with us, but with all the small groups in this region. All of this was the second phase in the groups development. The year 1995 is very important for the third phase of the group's development, because it brings the rise of two subgroups, who are the bearers of today's Boys 1995 and Dragons 1995 organizations. These were young groups which have developed significantly in the last 16 years and are today considered the old guard in North Zemun. In the middle of 2000's there is a sudden rise of the group, ie., all the group's good work from the previous years has begun to surface. Today's grandstands are made up of the said Boys and Dragons, in mid—generation there is the Zemun Trg group and all the younger people who have gathered around the New Guard. All of us together we comprise the Taurunum Boys. The subgroups we've mentioned have flags, and also there are people who are not in groups but instead take their names after different parts of Zemun that they are coming from, such as Ćukovac, Galenika, Novi Grad, Zemun Polje; however these are not subgroups but people from those city blocks who have gathered together in order to visit Zemun games. Tell us something about your town Zemun and his location. - For many years, Zemun has been a separate town which had its own history and all the marks of a city. Today, Zemun is just a municipality of the city of Belgrade. The point, however, is that no true Zemunian will NEVER consider himself a Belgrade citizen, even though the Belgrade center is only a ten minute drive away from Zemun. Zemun has become unitied with Belgrade in all aspects of life; however we are putting in a lot of effort and work into maintaining this football fan barrier and into attracting the younger fans, although our results are slim, the club is in pieces, and yet we somehow manage to defend ourselves against the more and more massive propaganda by Zvezda and Partizan all over Serbia. As for the Cigani (Crvena Zvezda fans nickname) and the Grobari (Partizan fans), they have members in Zemun, too. 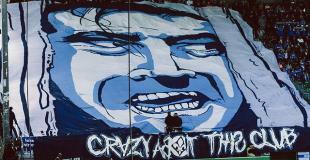 It would be madness to claim that they didn't, when they have fans all over Serbia. 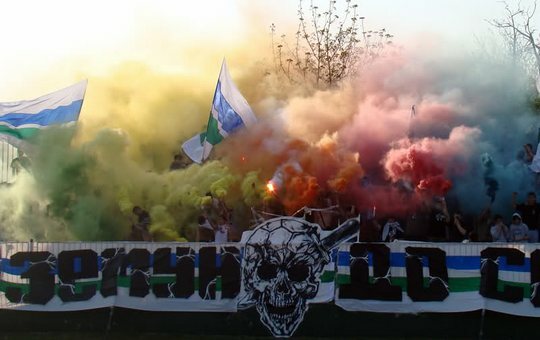 The Delije do not have an organized group in Zemun while the Grobari do, and when it comes to numbers, I believe that there are more Zvezda fans than Partizan fans. 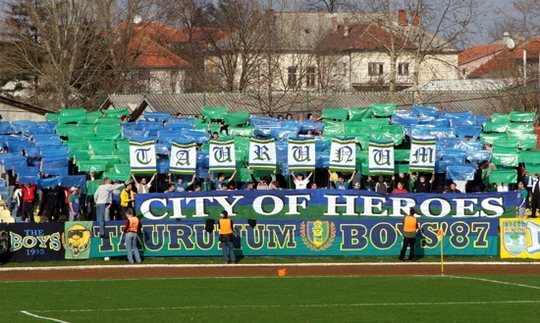 We, as well as they, know very well that Zemun belongs to us, and the saying goes that Zemun is all green and blue. We will continue to fight for every kid, every true Zemunian, and to terminate the philosophy that has been going on for 60 years in Serbia of dividing the fans into the black ones and the red-white ones. It is difficult to notice the hallmarks of other clubs, and even when they are seen, they become legitimate targets. The Zemun FC has been lining up bad scores for many seasons now. What was the situation in terms of scores in the last few years, and what is the situation today? - We have been in the major leagues for 17 years. After that we have dropped to the second league, and then the third – and all that in only two seasons. After that we moved back up to the second leagues, and this year we're back on the verge of dropping down to the third leagues again. The members of management, who were in jail at the time so we practically had to take over organizing for the players' visits. We have paid the trip for the players' last two visits, and we also had to pay for organizing games at home. 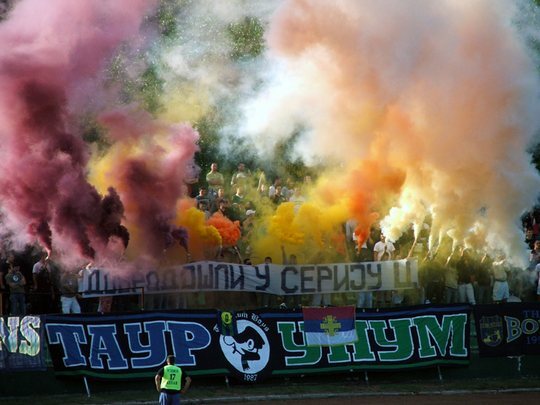 Zemun's play was bad, but once it dropped into the second league, your group has practically “exploded“. Can you tell us about how come it's the way it turned out? - Many of the society's moral guardians believed that dropping to the second and then to the third leagues would weaken us, but as it turns out people began to resent it, so we have basically experienced a fan explosion. That particular season in the third league has been one of our best seasons in the last 10 year. All the large scale visits and pyrotechnics, as well as some incidents – all the things that make the life of a true sports fan. And I repeat, the major role has been played by the resisting spirit in the people on account of all the things that the Football Federation has been doing against our club, and which they persist in doing. 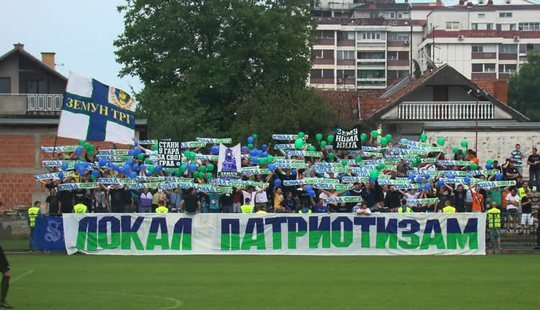 Zemun's best result so far is the time when the cup final was played against Partizan on the their stadium. Is that also the best performance done by your group on one match? 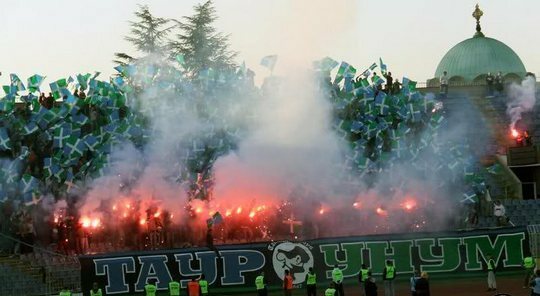 - Yes, the best score was playing in the cup final, but our best game (from ultras corner) in my opinion was playing the semif-finals against Ofk Beograd at home that same season, when about a 1000 fans gathered in the „kop“. There were more of us then in the cup finals against Partizan, and the support was way better. As for the finals, we had a party at the stadium on that day, we played music, and we were hanging out all day long, and it took us a long time to prepare the game because we had two different choreographies, sings, and pyrotechnics. There were about 700 of us, but I'm telling you, our greatest game was the one in the semi-finals against OFK, which preceded the finals. Have you got any friend groups? - We have the brothers and the friends of the group. Our brothers are the Djavoli (Red Devils) from Kragujevac, and we have this relationship since 1998. It all began when one of our more prominent guys has lived and has a family in Kragujevac and we visited a barrage match back when Radnički fought to enter the major leagues. Ever since then our brotherhood has been growing and growing, and today it has been passed to the younger generations. We have a friendly relationship, but more on a private level than a group level, with the Iraklis fans from Thessaloniki (Greece). The group is called Autonomo, and we have an excellent relationship with the guys from their clubs Autonomo Kilkis, Kavala and Trilofos. The visits are very frequent. We've visited several of their derbys, and the last one in the season's row was with Panatinaikos. They have visited us on several occasions, and the biggest group came when we celebrated coming back from the second to the first league. They came with us to Novi Sad, Niš, Jagnjilo and a few other home games. The friendship began when during the summer some people got in touch with the Greeks, and it just expanded. However, their group is much bigger than ours, and we don't seem them as brothers but, I repeat, friends of the group. 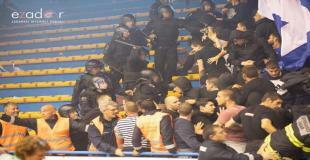 - As for that, we all know about our fights with the Firm, who are the Vojvodina fans from Novi Sad. They have been really rough on a number of occasions. 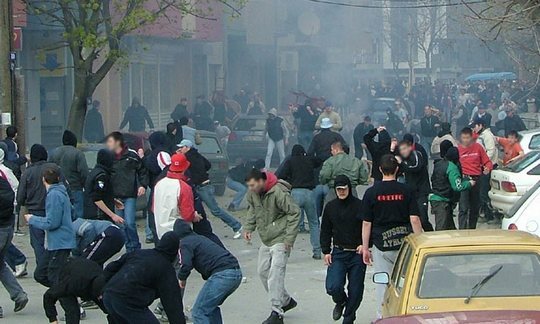 I'd also like to mention the fight with the OFK Beograd fans in Zemun 5 years ago, which many believe to be the bloodiest showdown in Serbia. I don't want to mention any details now for the obvious reasons. 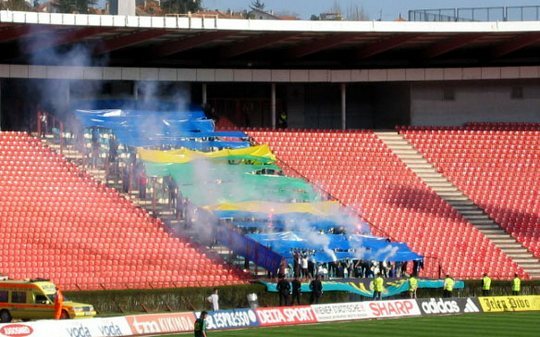 We have also had some sporadic incidents outside of stadium with the Delije and the Grobari, and 6 years ago with the fans of Rad from Belgrade. Earlier, our rivals were the fans of OFK Beograd, with whom we have organized the first fair fist fight on a meadow, where we won, and I don't think there is much animosity left between us, because we feel we can do much more. Our biggest rivals, if we want to respect tradition, are the Firma and the OFK fans – the Plava Unija (Blue Union). Since we have not played in the major leagues for years, and there is no real competition in the second and third leagues, because the majority of other groups are not taking it seriously, they are disorganized and do not attend regularly. - Currently we are fighting both for the group and for the club. 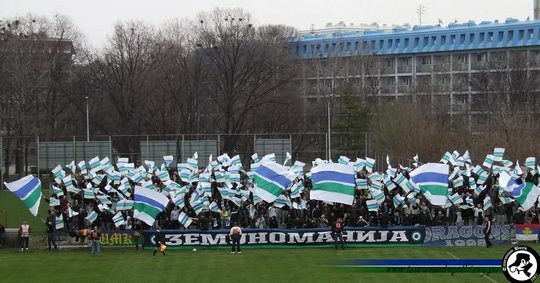 Our greatest success was being able to wake up the younger generations, the young fellows from Zemun, and to encourage them to support their club, and that in spite Zvezda's mobilizations and Partizan's "grobarizations", and in the absence of any club scores, we have managed to awaken this kind of local patriotism and to attract them. 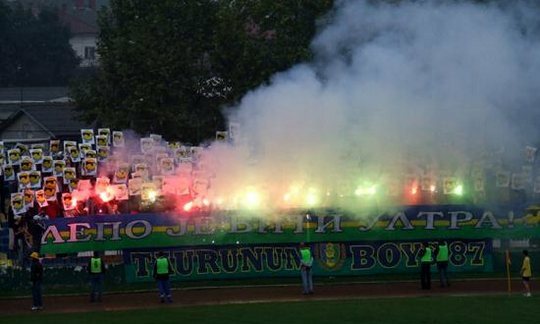 As I have already said about the subgroups in the grandstands, the real subgroups in the full sense of the word are the older Boys and Dragons, then the middle generation of 88,89,90 Zemun Trg, and the younger ones, who gather around the Nova Garda (New Guard). 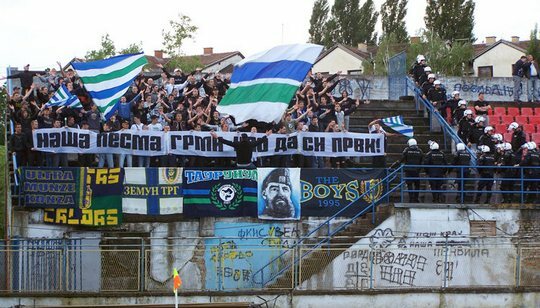 We also have a section from Pančevo, we have been on good terms with them ever since the group was founded, because the Pančevo fans have always visiting Zemun. We also have a ten-strong team of supporters who are over 40 years of age, but who follow the games inside their own organizations, but also support and help the work of the group at all times. They do not have a flag of their own, and are not considered a fan group. Tell us something about the police and the repression. - I can give you dozens of examples of the things we've been going through because of Zemun, and lately because of the national team, too. If I tell you that 7 of our people were imprisoned for 52 days in Subotica after they returned from Genova (Italy –Serbia riots) with no evidence or basis for arrest, you know what I'm talking about. Twice this season we have been banned by the police from entering the stadium when we visited the game with Basko, but also at a home match, which is a precedent in these parts that at the game where there no visiting, ie., home fans, and where there is absolutely no risk, for no reason whatsoever, that they should ban us from taking the grandstands. A lot of people are currently undergoing lawsuits with several criminal charges, however that did not break us, but only made us stronger. As for the current criminal charges we have 11 people who have been charged together for spreading religious and ethnic hate against Novi Pazar, and the thing with Genova, where there is still no evidence or any other basis for pursuing the case. There are dozens of other examples of police brutality, and I can give you video tapes of some of them if necessary. 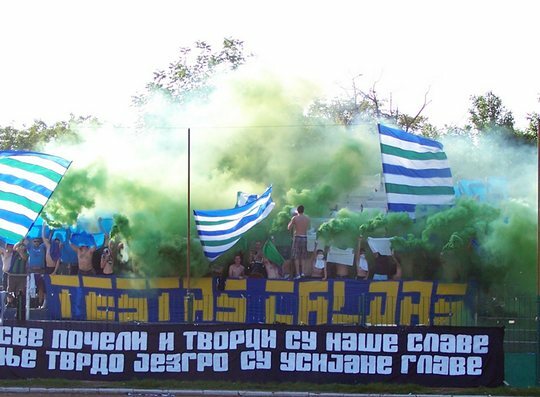 In 2008 you went on away match in Novi Pazar. Town in Serbia with mostly Muslim population. Also town known as forbidden for away fans (because of police). Tell us something about that action. - That 2008 visit was like in the movies. We went there two days earlier, posed as people who go around visiting churches, and we rented a house that we were supposed to be in until the game started. Since we were coming to the meeting place in separate smaller groups, it seems that the cab driver who was driving two of our guys reported something suspicious to the police, who came in together with the SWAT teams tomorrow early in the morning, blocked the house and the entire neighborhood, like we were the Al'Quaeda or something. We tried again last year, we were even close to the stadium, but the police saw us in the cafe on the day the game was to be played. They escorted us to a place called Raška in Serbia and deported us back to Zemun. Do you follow the national team? - We proudly state that we were one of the first groups to begin with the organized following of the national team. We visited Sarajevo, Brussels, Romania, Paris, Genova and many other European cities. When the national team plays at home, we have agreed to not organize the following, but those of us who wish to go organize ourselves and go visit the games. Now all the fans who follow the national team are in a very awkward situation because of the war with the Serbian Football Federation, which is sabotaging the ticket sales and making it extremely hard for the fan member teams to follow the national team. We have our reasons for our beef with the Football Federation, because they have been pushing us into the lower leagues for years and setting us up and stuff. After having won the right to play the Inter Toto Cup two times, this same Football Federation has cheated us out of some license, and they pushed their own clubs, who are protected by them, into playing European games. As for the national team, we'll see what happens and how it happens in the time to come, because we have a hot summer and fall ahead of us. Organisation of the group? Do you have your own supporters club? 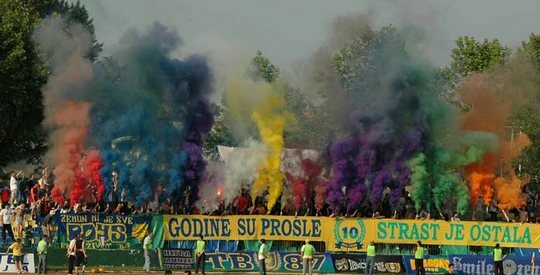 - We don't have a typical ultras club, but we do have one place – a cafe which is as good as ours. When we go on awy matches, we usually take buses or if its possible, we take the train. We pay for our own expenses because the club is completely broke; and even if it wasn't we wouldn't take a dime from it. We don't have a fanzine, but we often print information bulletin, which we use to educate people, both about the group, and the Ultra movement in general. What is your current relationship with the club management? - Since all the old management members are in jail, and the club meetings is only due at the end of the season, we have practically taken over the care of the club. We also organize transportation for the players' visits, and with the help of a few enthusiasts we try to provide the means for finishing the season. The players play and train for free, and we hope to see some improvements by the end of the season. 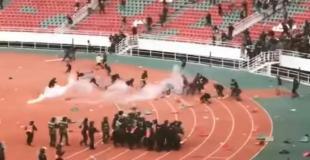 How would you comment ultras scene in Serbia today? - Currently there is a sort of a status quo in Serbia. There is some sort of an unspoken one year non-violence agreement, and we respect it. It was about time to start introducing certain codes, and to put a stop to it all after all the killing and all other ugly stuff. We are going to support all those actions which will benefit the scene in Serbia, and if necessary we can be a neutral group and initiators of such actions. It is all really hard, because a lot of hate and enmity has been breeded over the years, and every beginning is hard, and it's the same with all beginnings, but there were no casualties or injured in the last 4 months, which is a great success. 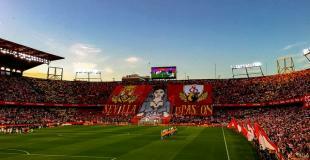 Our common trouble has made us do this, because here the very top of the state has been involved in the fight with the sports fans. The president of country threatens to deal with you, so isn't it the most logical thing to do to declare truce, so that both the movement and the scene itself wouldn't just disappear. We have journalists who work for state and the police, and now we even have the anti-fan police. The state wants to stiffle us through draconic prison sentences, but I think we'll get out of this, and that they won't be in charge forever. More photos could be seen here.